Products Archive - Your hair's daily dairy. Looks like butter; feels like butter. 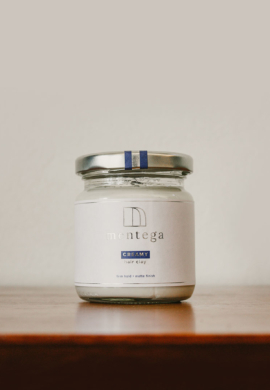 The Mentega Classic Firm Hold is an oil and wax-based pomade, designed to be your hair’s daily dairy. It has a firm hold with medium shine. It is made with nourishing ingredients such as cocoa butter and essential oils. Being an oil-based product, it is normal that it requires several washes before it comes off completely. The product residue after washing is commonly known as “build up”, which helps with keeping the hair in shape (not to mention, its moisturising benefits!) and require less product during the next application. 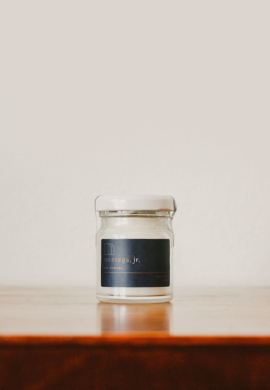 Packaged in a solid glass jar is 6oz of goodness, so you can butter it up as much as you’d like. It’s exactly what is says – creamy. This hair styling clay will smear like ice cream in your hands, making your styling process a smooth one. Creamy has a firm hold but remains light-weight; perfect to lift your hair for good volume. It has a natural matte finish for definition and texture. Re-stylable throughout the day like pomade and absolutely water soluble. Great for loose or messy styles as well as a neat natural look. 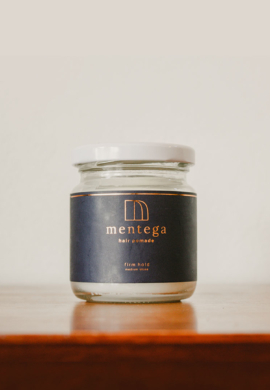 The Mentega Lagoon Water-based Pomade is our take on a hairstyling product that contains some of the best characteristics of traditional oil-based pomade but with water-based attributes such as water-solubility and without greasiness. 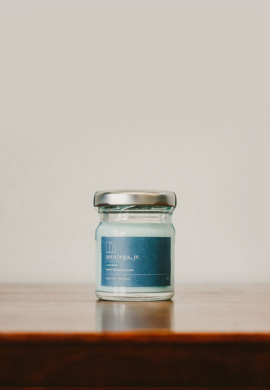 Mentega Lagoon is designed to be a strong hold pomade with a low shine finish — not overly matte but also not too shiny. It has the versatility to style a slick and tight or a more natural look. It is also re-stylable throughout the day like traditional pomade. If heavy amount is applied, there will be a minimal amount of build-up. 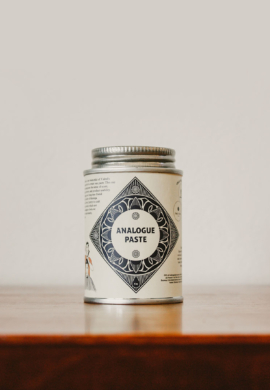 We are proud to announce to you our latest hair product, the Analogue Hair Paste. This project is a three way collaboration between Mentega, The Oven Cuttery and our good friends The Apothecary Malaysia. 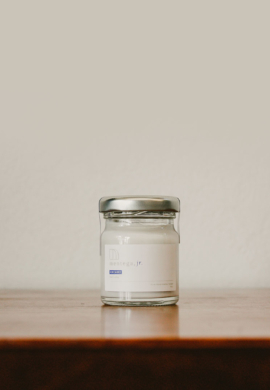 We formulated this product to be a strong (yes, we mean strong) hold and slick product, but the cherry on top is in its element of scent — the expertise of The Apothecary Malaysia. Being a hair product brewery that also runs a barbershop, we’ve had the opportunity to make various types of products while being able to learn about people’s hair grooming needs. With this partnership, we took it another notch. 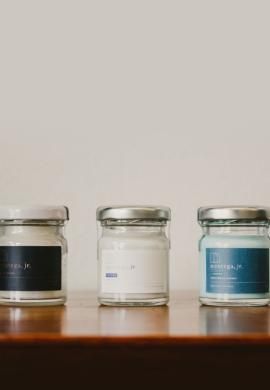 You now have a product with excellent hold and slickness with a scent to die for. Mentega, jr is our little version of the Classic Firm Hold, the travel sized companion. It’s small, light, and easy to carry wherever you may go. Mentega Creamy jr. is the little one of our Mentega Creamy Hair Clay. Creamy has a firm hold but remains light-weight; perfect to lift your hair for good volume. It has a natural matte finish for definition and texture. Re-stylable throughout the day like pomade but absolutely water soluble. Great for loose or messy styles as well as a neat natural look. 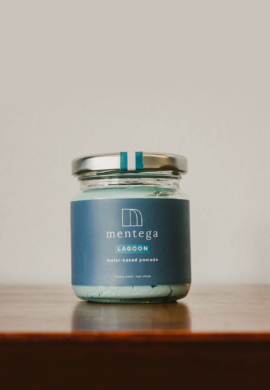 Mentega Lagoon jr. is the little one of our Mentega Lagoon Water-based Pomade. 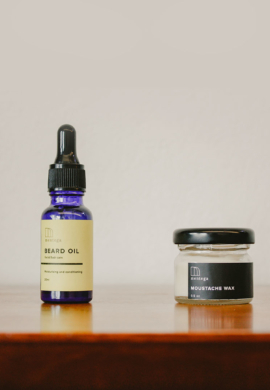 The Mentega Beard Oil is packed with nourishing oils to condition your beard and skin. It allows your beard to stay soft and moisturised but has characteristics of a thicker oil to shape your beard without making overly greasy. Works for both short or larger beards. Instructions: For smaller beards, use two to three drops, rub in palms, apply into the beard while getting it to the skin as well. For larger beards, use five to eight drops depending on beard size. Shape as desired after application. p/s: This product will promote hair growth, but isn’t a magical oil that will cause growth that isn’t already there! This styling wax is specially designed for moustache. It has a good firm hold and tackiness to hold your ‘stache in place and pull of a solid handlebar if you like. The ingredients used for this product will also serve as nourishment for your moustache and skin. Instructions: Use the back of your nail to scoop up a small amount (the strength of the product cause the product to be harder). Use your fingers to warm the product until it melts evenly. Apply onto the moustache and style as desired. Great things seem to come in a band of three. Here are our travel size Mentegas from our hair grooming line – the Classic Hair Pomade, Creamy Hair Clay and Lagoon Water-based Pomade. The jr. bundle allows you to have the whole collection and meet your different styling needs at the palm of your hands. To find out more about each product, click on their names above! This is our facial hair duo. The all-you-need for your facial hair grooming. 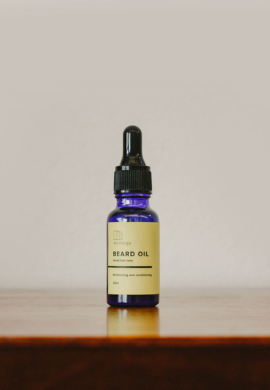 The Beard Oil has enough density to mildly shape your beard but clean enough to avoid being greasy. 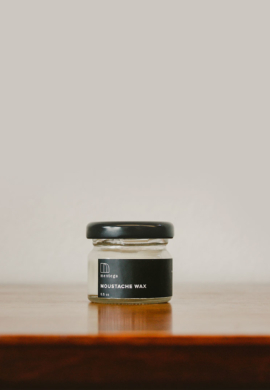 The Moustache Wax is a strong and tacky wax to keep your moustache styled and tamed as desired. For more info of both products, click here or on their titles above in the text description. This Old-Fashioned Shave Cream reminds us that shaving is a skill passed down from generation to generation and as such, a thing of true value, like a good piece of advice. It’s part ritual, part preparation, all ‘you’ time. 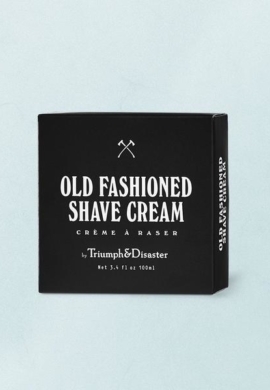 Triumph & Disaster Shave Cream delivers a great shave without the any of the nasties we now frown upon. Unique aromas of old school medicinal notes, bright, fresh citrus tones and a hint of Turkish barbershop at the back end, evoke a sense of tradition and nostalgia befitting a gentleman’s morning ritual. MORE THAN 100 SHAVES IN EVERY JAR.